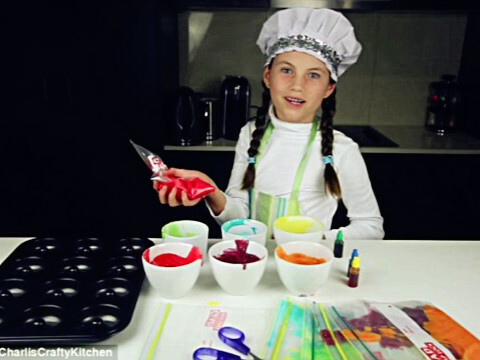 An eight-year-old girl from Australia is well on her way to building a successful business empire after it was revealed that her playful videos, featuring her easy-to-follow confectionery recipes, are bringing in around $127,000 a month in ad revenue alone. The mini-Martha Stewart, who is known simply as Charli, has turned her popular channel, CharlisCraftyKitchen into YouTube's largest food channel in less than three years - beating household names such as celebrity chef Jamie Oliver to claim the prestigious – and lucrative – title. 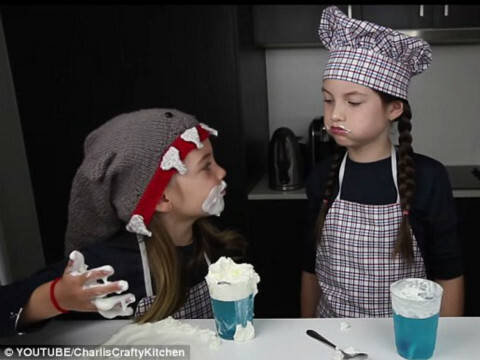 Meanwhile, Charli and her five-year-old sister Ashlee, who serves as the channel's 'chief taste tester', are raking in an average of 29 million views per month for their crafty how-to videos. The tutorials even have their own short opening credits featuring Charli and Ashlee's cartoon likenesses, with one of the girl's singing: 'Welcome to Charli's Crafty Kitchen where you can eat what you make'. Many of clips are inspired by the holidays, with a demonstration on how to make a Kit Kat Christmas cake receiving more than two million views since it was posted in December. Charli started CharlisCraftyKitchen in 2012 when she was only six-years-old according to her channel's description, which notes that she 'has always been passionate about her craft and being in front of a camera'.